The plot: After a season’s worth of trying, the Doctor finally figures a way to swan off to Metebelis 3, but Jo suddenly develops a more earthly interest in Welsh chemical company shenanigans, the deaths they seem to be causing, and Professor Jones, the eager young scientist hoping to put a stop to all of this. 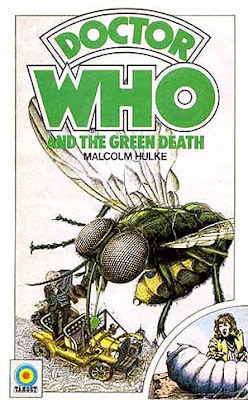 The Doctor flies off to sulk (and almost gets killed), but eventually joins up with Jo and the rest of UNIT in Wales, where they all meet up with Jones and the World’s Smartest Hippie Commune to figure out what’s with up with all the green, glowing dead people and maggots the size of large dogs. Turns out the chemical company is run by a computer (the B.O.S.S.) who’s gone all Skynet and really doesn’t care about giant bugs or human nightlights. 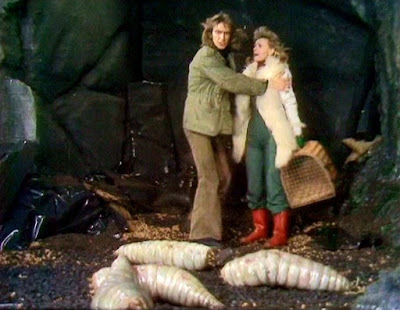 UNIT fights some hilarious giant mosquitoes, the Doctor outsmarts the B.O.S.S., and Jo ends up leaving to marry this Jones cat, because vowing to spend the rest of your life with some dude who treated you poorly back in Episode One of the serial is standard operating procedure for female companions in classic Who. The Thoughts: Let’s get this out of the way immediately: no way in hell should this story have been six episodes long. 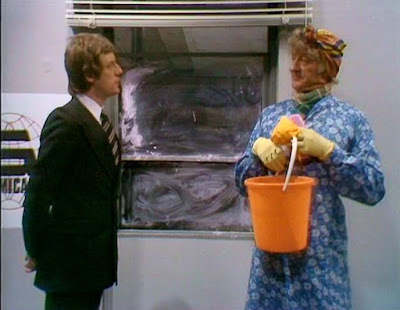 At four, it would have been a good Earth-based (if occasionally goofy) Pertwee yarn, but at six there was just too much padding. 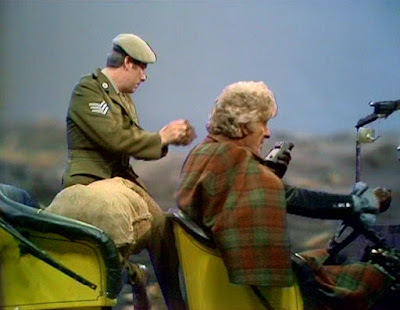 And though I could remark about all of the terrible green screening going on here, that’s pretty much a given in this era of Doctor Who, so let’s just move on. Although draggy, it was still a decent story, thanks in large part to Pertwee himself. Though his Doctor was always the dapper, gentlemanly man of action, he also had a stubborn, petulant streak beneath the surface, and we see a lot of that here. He all but holds his breath and stomps his feet when he refuses to go to Wales without visiting Metebelis 3 first, and he is incapable of hiding his jealousy when Jo announces she’d rather go down and meet Professor Jones (a man she says reminds her of a younger version of the Doctor… ouch) than run off on another adventure with him. His hurt is even more palpable (though better hidden) once he meets Jones and realizes he actually has a lot of respect for the guy, calling him “brilliant for his Age” (not merely his physical age, mind you, but the time period in which he lives… no small compliment from the Doctor). He knows the May-December fantasy he’s been living with her can’t – or at least shouldn’t – compete with the future she could have with Jones, so he doesn’t fight it, and his literal ride off into the night at story’s end is heartbreaking. Make no mistake here, folks, however chaste their relationship may have been physically, the Doctor clearly loved Jo just as John Steed loved Mrs. Peel. Admittedly Jo Grant was always more Tara King than Emma Peel*, but I think the comparison is apt, especially as this story pretty much marks the end of Doctor Who’s Avengers period, since the next season, Pertwee’s last, sees the return of a lot of traditional Who elements that were missing in the largely Earth-based, crazy espionage/world-saving seasons before it. And you know, watching these as a kid, I was never a big fan of the early Pertwee stories because there was never enough space stuff. But now those are some of my favorites specifically because of the “Avengers with Monsters” aspect, and it’s this period that makes Pertwee one of my favorite Doctors of all. Funny, that. Overall: Two episodes too long, but worth watching for the performances, the silly bugs, and the only hippie commune in the world that actually tries to save the world rather than just talk about it, decide that’s too hard, give up, get high, and listen to Dead bootlegs instead. It also gets points for being the rare UNIT story where the soldiers don’t just stand around and shoot at monsters, wondering why their bullets don’t work. Well, I mean, that happens, too, but Mike Yates gets to play undercover agent, and the Brigadier proves himself a charming dinner companion, so it’s nice to see them get to be real characters. But Jon Pertwee is the gold standard here, and Katy Manning’s Jo, a character I never cared much for, finally wins me over in her final bow. Also, the Doctor crossdresses at one point. That's something you kind of need to watch. *Making Liz Shaw his Cathy Gale, of course. Sarah Jane Smith, however, was not the Doctor’s Mrs. Peel, because she could never be anything other than Sarah Jane, the companion by which all others are measured. Oops, this one slipped by me, because I would have surely commented. Green Death is, after all, a nostalgic favorite. 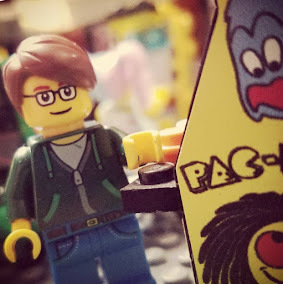 When we were kids (well, teens), my sister, my brother and watched the whole of the Perwee era, a half-hour at a time, after school (on YTV maybe?). The high point, still mentioned around the Christmas Day table more than 20 years later, is the giant fly from this story. And doesn't Jones look a little like the 8th Doctor? Jo had a point there.